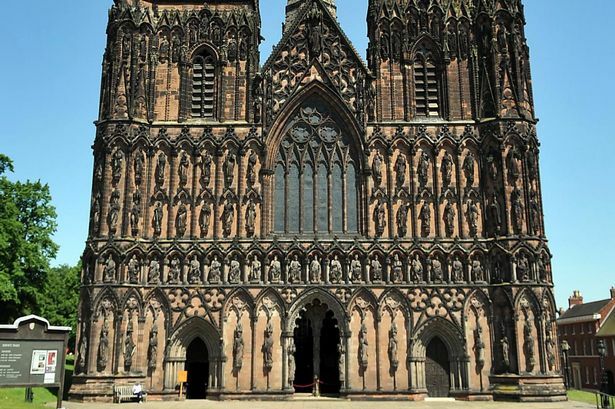 Landmark Lichfield Cathedral is at the centre of a £20 million appeal to halt its disintegration. Landmark Lichfield Cathedral is at the centre of a £20 million appeal to halt its disintegration – and propel the site into the Premier League of places of worship. The new High Sheriff of Staffordshire Johnny Leavesley is spearheading a campaign for multi-million pound spending on conservation and improvements over the next ten years – and substantially swell visitor numbers. Mr Leavesley says he wants to see Lichfield up amongst top ranking cathedrals such as Durham , York and Canterbury, providing a catalyst to attract more visitors to Staffordshire and the wider region. Among urgent restoration and improvements needed on the site, a place of Christian worship for more than 1,300 years, are remedial work to wiring and lighting, increased access and improvements to Cathedral Close and excavation of the moat. Mr Leavesley, who is chairman of the cathedral appeal committee, told the Post: “It is made out of sandstone, which means it is disintegrating every 150 years. There is always masonry work which needs doing. “There has been a church on site for 1,300 years and the cathedral building is over 700 years old, from the medieval era. Mr Leavesley said one urgent area of work was the wiring and lighting which was last upgraded in the 1950s. He added: “We know that we need to change the wiring and upgrade the lighting. “We have made an application to the World War One Commemoration Fund. We have applied for £1 million and are hopeful of that. We are also going to do a full-scale Heritage Fund Lottery application which takes about a year to make. That is going to cost £20,000 and we are going to go for £4.8 million. It is quite rare for a cathedral to take this step. “Most of the work would be for Cathedral Close. We want to open up walkways and increase access. “There is more work to be done on the Chapter House and above the Chapter House is a wonderful medieval library. “We need a visitor centre on a par with the great cathedrals, Durham, York and Canterbury. Lichfield needs to catch up with them, it has the potential to join the ranks of the top cathedrals. “It would be good to open up Cathedral Close – there is public access there but it is rather forbidding . It is hard to get into it, there is a bank of vegetation next to Stowe Pool. The cathedral recently reached the end of a £3.7 million project to restore the East End of the building, the Cathedral’s Lady Chapel, including the removal, conservation and re-installation of the famous Herkenrode Glass, one of Europe’s greatest artistic treasures. Mr Leavesley said the facelift work on the cathedral could pull in more tourists to Staffordshire. Mr Leavesley and his brother run the Leavesley Group, based in Alrewas, encompassing property, trading and agriculture.